World Cup Final 2014. Sports commentators, perhaps misguided by the notion that if an FIH Umpire applies or fails to apply a Rule in a certain way (using ‘common practice’) then that way must be correct, causes confusion among viewers by lauding a foul by a NED player as if it was a proper and desirable skill. Below is what the FIH Rules Committee wrote under the heading ‘Rule Changes’ in 2011 in the Rules of Hockey – when ‘forcing’ was deleted as a stand alone offence. (My apologies that above statements, which remain extant, are more than six months ‘old’ and were given in writing in a previous rule-book – and are therefore ‘black and white’ and ‘ancient history’ – unlike the ‘latest interpretations’, stories of unknown origin, which are passed on by word of mouth – it is difficult to think of a more inaccurate form of communication – or on the Internet, possibly the worse form of cascade because much of it is not attributable and certainly not official opinion). If an illegal playing action results in penalty in the opposite direction to that which it did (or should have) previously then there has been a fundamental change to the way in which the game is officiated and therefore played i.e a change in its characteristics. Forcing contact was an offence, raising the ball into a player from close range still is an offence, playing the ball along the ground (with modest force) into an opponent’s foot has never been considered any offence except a forcing offence. So what is the umpire to do? It is obvious that the statement because any action of this sort can be dealt with under other Rules is untrue and a case of the Rules Committee not knowing their own Rules, so the grounds for the deletion because..etc..were a nonsense. There is no mention at all of forcing in the current rule-book, so even the instruction, issued in 2011, that forcing should, where appropriate, be penalised using other Rules is not there to inform today’s umpires. However, the aim of simplification was achieved; it is simple to always penalise, no matter what the circumstances, a player who makes a ball-body contact: this is what is happening and it is simple-minded. It does not require though or judgement. “Did the ball hit a foot?” is an objective criterion not a subjective one but it does not comply with the intent of the Rule which is to ignore as irrelevant most ball-body contact. In these incidents from the Rio Olympics (video below) the umpire awarded (after consultation with his college !!!) a second penalty corner (the first having been correctly awarded) because from the shot made from the first penalty corner the ball touched the foot of the goal-line defender (a foot which was sticking out wide of the post) on its way out of play. The shot from the second penalty corner made in the same way as the first also glanced off the defender’s foot and went out of play- so yet another, a third, penalty corner was awarded. So two penalty corners awarded in direct conflict with instruction given in the Explanation of Rule Application. Such umpiring makes one wonder if these umpires have actually read the Explanation of Application provided with Rule 9.11. They took the time to consult with each other after the first contact and still got it wrong. The words “any action of this sort can be dealt with under other Rules” can only mean in the context, that any forcing action can and should be penalised using other Rules already in place at the time. But by 2014 ‘the interpretation’ was the opposite, it was always the player forced to ball-body contact who was penalised. In fact this was also the case prior to 2011, when the forcing (of ball-body contact in particular) was still clearly an offence, by the player doing the forcing. So, as far as umpires were concerned, there was no fundamental change in 2011, when the offence of forcing was deleted, they just kept doing what they had ‘always’ done and misapplied the ball-body contact Rule – often when the forcing action was also clearly dangerous play (a breach of Rule 9.9) because the ball was raised. At one time (1992) ‘what umpires had always done’ i.e ignored the written Rule or ‘interpreted’ it in a bizarre way (in a way opposite to the way it was intended to be applied) so infuriated the Rules Committee (at the time called the FIH Hockey Rules Board) that the criteria for a ball-body offence was changed to – both deliberately using the body to stop or deflect the ball and the gaining of an advantage (that change lasted until 1998). The 1992 change to the criteria for a ball-body contact offence made no difference whatsoever to the way umpires applied the Rule, they just continued doing exactly as they had done prior to 1992, when the two criteria were – intentional use of the body or a gain of advantage (and they umpired as if any ball body contact always gave an advantage to the player hit with the ball, which was what led to the change made in 1992. That ‘penalise all’ approach to ball-body contact is familiar to us now, in 2018, although still contrary to the Explanation of Application given with the Rule since 2004 and even to the change made in May of 2015). (‘Gaining a benefit’ was deleted in Jan 2007 – without making any difference at all to umpiring practice (Peter von Reth would not allow it to), and only reinstated, as ‘gains an advantage’, in May of 2015, so we have fairly recently completed yet another cycle of the ball-body contact ‘no change to umpiring practice’ merry-go-round. The most recent development in the forcing and ball-body contact saga has been the introduction (2017) of a ‘drilling’ dangerous play offence in indoor hockey (dangerous forcing using high ball velocity combined with a spin with the ball from a shielding position – see first video above)- but with no counterpart in the outdoor game – despite a declaration from the FIH that the Rules for the two games will be kept ‘in sync’ as far as is possible. Why this Rule has not been incorporated into the outdoor Rules is a mystery – it’s certainly possible to do it – even desirable . The action of the NED player in the first video is a ‘shield, spin and drill’ and the defender had very little chance of avoiding the ball-body contact the attacker intended would result. I can’t see what advantage the defending team gained from the ball-leg contact, so I don’t know why the defender was penalised. The match commentators had no doubt that the forcing of the contact was carried out deliberately, they just had no idea that such forcing is supposed to be penalised (as any forcing may be) under “other Rules” – that is no surprise, this action has never been penalised as it should be and obstruction (illegal ball shielding) has been forgotten about. ‘Drilling’ following a spin-turn from a ball shielding position developed because ball shielding (obstruction) has not been penalised as it should be since around 1994. Here is an example. The obstructed player looks in astonishment at the umpire, as as well he might, when the following forced contact (illegal at the time the match was played 2010) resulted in his being penalised for ball-foot contact. 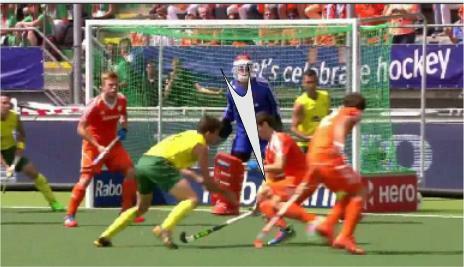 The following video shows an attacker deliberately raising the ball into the legs of a defender from within 1m; the ball then deflecting off the defender to the advantage of the attacker (so the defender could not possibly have gained an advantage because the attacker did, the ball-leg contact was clearly not intended by the defender, so according to the Rules of Hockey the defender did not commit an offence). The attacker declined to play on even though he could easily have done so, the umpire (automatically) awarded a penalty corner. Dangerous play, arising from a dangerously played ball, has not been penalised as it should be since around 2002 (following the publication of ‘The Lifted Ball’ an umpire coaching document, produced in the previous year). There followed in 2004 a number of Rule deletions and amendments which eventually led to the ‘on target shot’ nonsense. A blatant example (below) of deliberate forcing by an attacker who preferred to ‘win’ a penalty corner rather than attempt to shoot at the goal even though he was in the circle and goal-side of the defender he fouled. This was combined with what is technically dangerous play (the ball propelled at low velocity so unlikely to cause injury, but contrary to Rule 9.9 as it hit the defender, from within 5m – and also at at above knee height – but that latter point is not a criteria for the offence – the Explanation of Application of Rule 9.9. mentions only the raising of the ball towards an opponent, it does not stipulate a minimum height). Penalty corner awarded. Here is another blatant example from the 2014 World Cup Final. The umpire was positioned directly behind the player who was hit with the ball and could have had no idea how high it was raised (it hit the defender on his thigh) but he waved away protest from the NED players. He should however have been aware that the AUS player charged bodily into the NED defender following raising the ball into him, to deny him opportunity to control the ball, obviously a physical contact offence. Why the NED players did not go to video referral I don’t know; bitter experience perhaps, but the goal scored against them from the corner must have been more bitter to swallow. What was laughable about this incident was the amount of trouble the umpire went to to ensure that the ball was placed on the base-line during the penalty corner before it was inserted. Very close to the line was not good enough: an insistence on technical Rule compliance which was at odds with the seriousness of the deliberate dangerous play/forcing Conduct of Play offence he rewarded the AUS team for. The match commentators saw nothing untoward about the AUS player’s forcing action, the physical contact or the award of a penalty corner against the NED team; they expected the award of the penalty corner the AUS player went ‘looking for’. Rule ignorance seems to be obligatory for television match commentators. Rule 9.9. Explanation of application. Players are permitted to raise the ball with a flick or scoop provided it is not dangerous. A flick or scoop towards an opponent within 5 metres is considered dangerous. if a defender is within five metres of the first shot at goal during the taking of a penalty corner and is struck by the ball below the knee, another penalty corner must be awarded or is struck on or above the knee in a normal stance, the shot is judged to be dangerous and a free hit must be awarded to the defending team. In open play, which is subject to Rule 9.9 but not Rule 13.3.l. a ball may not be raised towards (at, into) an opponent within 5m – I repeat there is no minimum height given for that to be a dangerous play offence. The Umpire Mangers’ Briefing (which is not the Rules of Hockey) states that a ball raised into an opponent, in a controlled way, at below half shin-pad height (20cms?) is not dangerous (this statement conflicts with what is given in Rule 9.9 – such conflicts should not happen because they are, despite any liaison between FIH Committees, an unauthorized amendment to written Interpretation – this might be overcome by having FIH Executive approval the contents of the UMB). The UMB, while stating what is not dangerous play, is careful to avoid stating what is dangerous play. General practice is to (sometimes) penalise for dangerous play only if the ball is raised into an opponent at or above knee height, but there is no Rule support whatsoever for this practice in open play. In the incident shown in the video below the video umpire based her recommendation for a free ball to the AUS team on the ball being played into the AUS defender at knee height. The match commentators were sure a penalty corner would be awarded – so the Rule knowledge of the video umpire was marginally better than that of the commentators, but not correct. There can be no doubt that had the ball been raised into the defender’s shin, rather than into her knee, a penalty corner would have been recommended by the video umpire. (Futher ‘forensic’ examination of the above incident by correspondents on YouTube, months after I posted the video, revealed that the ball was played onto the defenders stick and from there deflected up into her leg – there can be little doubt that the attacker intended to play the ball into the defenders legs but she did not actually do so.). The ‘gains benefit’ saga is a prime example of an official FIH Rules Committee Rule change being prevented in a way that was without any authority whatsoever. Due to the ‘generally accepted’ way of applying ‘gains benefit’ prior to 2007, mentioned above, the FIH Rules Committee deleted that criteria for a ball-body contact offence in the Rules of Hockey issued in January 2007 (an opposite approach to the one they took in 1992). In February 2007 Peter von Reth authored an ‘Official Interpretation’ on the FIH website in which he explained (without offering a rational explanation) that he and the Chairman of the FIH Rules Committee and a couple of unnamed others had agreed to the reinstatement of the ‘gains benefit’ clause and it would continue to be applied as it had been applied in 2006. The 2005/6 Rules indicated that it was not an offence if the ball hits the foot, hand or body of a field player unless that player or their team benefits from this. However, as with other rules, this continues to be an offence if benefit is gained. Rule 9.11 should therefore continue to be applied taking into account any benefit gained by the player or their team. That statement is irrational (and an insult to the intelligence of participants). Because “unless that player or their team benefits from this” means exactly the same as “if benefit is gained” (the bolding of ‘is’ is not explained by the bolding of it), so the entire explanation offered is contained in the words “However” and “Therefore” and justified by “general discussion” and the unspecified feedback apparently received from various parties and a few unidentified National Associations – and given after the change to the Explanation of Rule 9.11. was made public, three weeks before the above reversal was published. In other words there was (despite the title given to the announcement article) no official explanation or justification (indeed no justification of any sort). In passing it should be noted in relation to (“However, as with other rules, this continues to be an offence if benefit is gained“) that there was and is no Rule, other than ball-body contact, in which ‘benefit gained’ was/is used to determine offence and never has been. The Advantage Rule, which declares that there is no need to penalise an offence if no advantage is gained by the offending team (opponents are not disadvantaged by the offence) is not the same as the gains advantage statement in Rule 9.11. which in fact converts a ball body contact, that is not an offence, into an offence if benefit is gained by the team of the player hit with the ball. The difference between the Advantage Rule (12.2) and the ‘gains advantage’ clause in the explanation of Rule 9.11 is unnoticed by many umpires and advantage is commonly misapplied. The previous long-term disquiet about the way the Rule was being applied under the 2005/6 Rules of Hockey and those of previous years – the reason for the change made by the FIH Rules Committee (active from Januray 2007), after the usual consultations with all parties when a change is to be proposed to the FIH Executive, had taken place and Executive approval received, was just brushed aside within a month. The ‘gains benefit’ clause was flawed because it could be used as a blanket ‘catch all’ when badly applied, but it should not have been deleted in its entirety, it should have been amended to make it both fair and workable. The deletion was extreme and we were then just forced back to acceptance of a previous extreme. This type of pendulum swing between extremes is common even in official Rule amendment, we went for example from pitch length chip hits to a total ban on all intentionally raised hits, except hits made as a shot at the goal – the unrestricted exception being a sick joke if player safety was supposed to be the aim of the change, which banned intentional raising of the ball with a hit. The whole thing could have been dealt with by a height limit on any ball raised with a hit – and refined with another limit placed on any ball raised at an opponent with any stroke, even when taking a shot at the goal. It is necessary I believe to retain the height limit on the first hit shot at goal made during a penalty corner. There is no reason to height limit any other shot made at the goal that is not made directly at another player, but there are very good reasons to height limit any ball raised directly at another player. There are still a number of ‘loopy’ Rules in place (as dangerous or nonsensical as the now deleted ‘Own goal’ ) but the biggest danger to players and the future of the game is ‘interpretation’ and ‘common practice’ (umpires being instructed by their coaches to ‘overrule’ or ignore the Rules provided by the FIH Rules Committee). It is for example forbidden to make a shot at the goal in a dangerous way during a penalty corner (and by common sense extension at any other time during a game) but one would never know that by watching the playing of any hockey match. Other examples of ‘practice’, are seen in the above videos from some of the most senior umpires in the world – i.e. personal opinion – formed and derived from direction and coaching – that bears no resemblance to the meaning of the wording given in and with the FIH Rules of Hockey. In other words umpires are interpreting words (very badly) instead of interpreting player actions in relation to commonly well understood instructions contained in the Rules of Hockey. Where instruction is not commonly well understood then the issues need to be addressed to the FIH Rules Committee – not subverted in ‘interpretation’. Players, who are required to be aware of the Rules of Hockey and play according to them, have no chance of doing so with the ‘interpretations’ shown above (and I have not mentioned at all the edge-hit ‘clearance’ or the high ‘cross’ into the circle with either the edge-hit or an undercut forehand hit). Players who deliberately breach the Rules, are coached to flout them, get away with doing so because what they are doing has illegally or unconstitutionally become ‘accepted’ and ‘common practice’ within our umpiring culture (penalise a raised hit only if dangerous – but see no danger that occurs) – is a meme of hockey.